When you have a migraine and diarrhea. Joel Embiid is dealing with a few ailments. 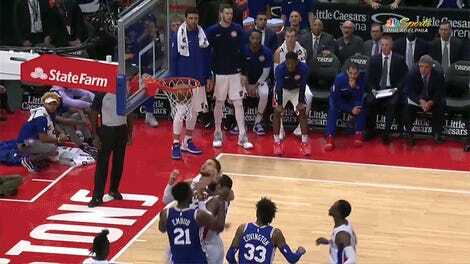 The Sixers beat the Pistons last night, 116-102, and Embiid had 24 points and eight rebounds. He was plus-30. He had returned to the starting lineup after being given the night off for a game against Detroit on Friday. It was also his first game since he said he was somewhat unhappy with how he’s been used since the Jimmy Butler trade. But that’s the lesser story here. The real story is, postgame, a reporter asked Embiid if he’d been dealing with a migraine that night. He had! But he’d also been dealing with diarrhea. As in: “I have a migraine and diarrhea,” Embiid said. No wonder he wants to be down on the block! What defender wants to guard a 7-foot-3 guy with diarrhea? Is Joel Embiid&apos;s Mask More Superhero Or Supervillain?